Be captivated by the taste. Enjoy the pleasure of its purity! Every bottle of hand crafted Caveman Vodka is distilled from Paleo-friendly, Gluten-free California grapes instead of grains. If our Paleo ancestors had a chance to unwind after a long day of hunting and gathering, this - without a doubt - would be their drink of choice. 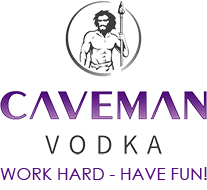 Contact us online to find out more about Caveman Vodka and our caveman community.